Healthy Snacks: Baked Apple Chips Recipe - EASY to make! A crispy Apple Chips recipe with sea salt that is healthy and easy to make! We worry about gaining weight with all those chips we consume while sitting in front of the TV! These homemade baked apple chips are healthy snacks to replace your favorite bag of potato chips! 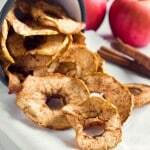 Baked apple chips are one of the best healthy snacks for a weight watcher and a health freak. Plus, they don’t require any effort and aren’t too expensive. Whichever your kind of apple you choose, it depends on your taste. Start by removing the core of the apples. Thinly slice the apple. The thinner the apple slice, the crispier the chips. If you want to get them to look like apple rings (like the photos in this post) use a apple corer. Sprinkle them with some salt. The salt adds a nice contrast to the sweet flavor the crisps. Pop the apple crisps in the oven. Let them bake in the oven for 45 minutes and then flip them to the other side for 30 more minutes. This guilt-free snack will surely make your day as you will neither be feeling heavier on the stomach, nor on the heart. With October just arriving, and a weekend spent with my family picking apples – I couldn’t wait to make these Apple Chips! Bonus: The entire family family loves them, including my toddler daughter! 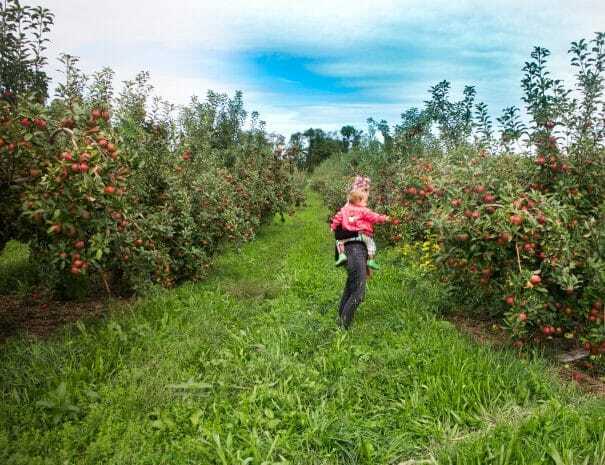 She also loved apple picking…! Apples and salt, that sounds like a pretty delicious and healthy option for me. For this apple crisps recipe, I bake them in the oven to give them a nice crunch. You can also use a Cozyana air fryer. We have all heard ‘an apple a day keeps the doctor away’, so why not make it happen. Never did I once believe that I could achieve such a basic recipe with Apples! Once you have tried this Apple Crisps Recipe, also try my 1 ingredient apple juice recipe! Next time you’re craving healthy snacks but want to look outside of the snack aisle section, head to the produce part of your grocery and pick up some apples! Apples are high in fiber and vitamin C with 0 fat and cholesterol, making them perfect as healthy snacks. Discard your bag of potato chips in favor of these baked apple chips. 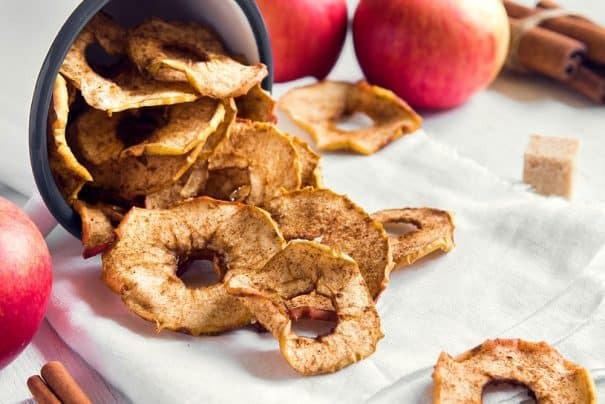 These Baked Apple Chips are a great alternative for crunchy potato chips. They’re baked and sprinkled with just a bit of sea salt…to give your mouth a combination of sweet and salty taste. You’ll be surprised to see how you turn those apples into a whole new experience. Invite some friends over and introduce these baked apple chips as a healthy option, they will thank you later for it! Hope you enjoy these Baked Apple Crisps Recipe with sea seat! Want to try more of my healthy snacks, check these Baked Spinach Chips or Sweet Potato Cookies! If you try this recipe, please leave a comment or share it on Instagram with tag #brooklynfarmgirl – I’m always looking for photos to feature and share! Remove the core of each apple and cut into slices, very thin. Preheat oven to 250 degrees. Spray cookie sheet with nonstick spray. Arrange apple slices on cookie sheet, sprinkle sea salt on top. Bake for 45 minutes, flip and sprinkle a bit more sea salt on other side. Bake for 30-45 additional minutes or until crisp. oooh healthy chips! Nice. Also THE HEADER!! I love seeing it change with holidays haha. Your header rocks! Made my morning 10x better! As do sea salt apple chips. I will always take tortilla or pita over potato, but now I’ve got these in the mix! 🙂 They look amazing! Love love love apple chips! The addition of sea salt is so smart. Next time definitely adding sea salt! Well, I adore potato chips, but need something better for me. These sound perfect. We open our presents in the morning. LOVE the new banner – especially the kitties 🙂 Your apple chips look delish! I love this recipe! It’s very creative, Thanks for sharing! Venturing out to the shops is insanity right now so I’m too scared to but I suppose it’ll have to be done …inevitably I’ll need a last minute pick up. Not looking forward to it however, these would provide a silver lining—how delicious! Another delicious way to enjoy apples. The new banner looks so festive. We open one present on Christmas Eve then the rest on Christmas morning. I still have a couple of gifts to get but I am mostly done with my shopping. The baked apple chips look like a tasty and healthier snack than regular chips. YUM. Beautiful and healthy snack, love it! Very fall-like – love it! I may try dehydrating these bad boys. These sound great! Exactly what I’m going to need to be snacking on once the holidays are over and I need to flush out the massive amounts of refined sugar from my body and start eating healthy! I love, love your new banner: it looks lovely! 🙂 So seasonal too! I have not even started my shopping! Yikes eh?! Fortunately my list isnt long, so should be done in half a day. My dad is the hardest to shop for too! I love apples in pretty much any form, but especially chip form. BTW love the festive new banner! love the apple chips. we open gifts on the eve with family and on the day with friends… but growing up we opened them on the day (after waking the night of to shake every last one under the tree). 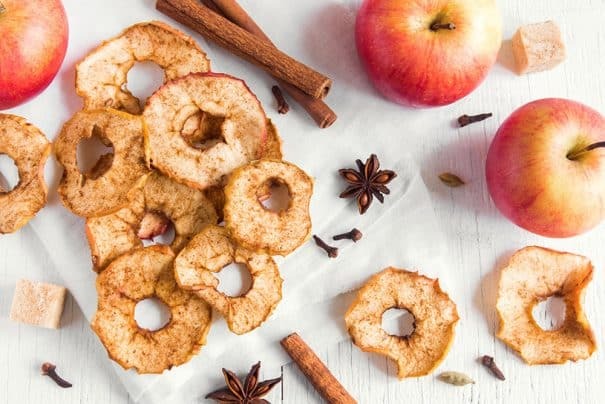 Love these apple chips and that you are sharing a healthy recipe, I need some of these to balance out all the cookies and chocolate I’ve been indulging in hehe. Your new festive banner is awesome and super adorable Pamela! I am where you at and not quite done with my shopping or homemade gifts either but so wish I was. I have a few people that I have no idea what to get too. Love the header! It’s very festive. We always open our gifts on Christmas morning. And I’m super-close to having my shopping done! LOVE the header! So cute! When we were kids, we would open gifts on Christmas day, but now we open them on Christmas Eve and spend Christmas Day relaxing and eating. I am almost done with my shopping, just have to check a few more things off my list this weekend and I will be done. These apple chips look perfect! Love the apple chips, would be good in a ziplock tucked in the purse for an energy boost while holiday shopping. I haven’t even started, ugh… I really like your holiday header! Your banner is so festive! I’ve made apple chips before on my blog so I know they are ADDICTIVE! I need to make these again because they are so great for snacking on! I’m not that ready for Christmas…since I’m going to New Zealand on the 22nd, I feel like I am kind of skipping Christmas this year 🙁 Truthfully I’m not, I will be celebrating it there, but it’s without my family! It’s going to be very different. Apple chips with SEA SALT!? Why did I not think to make this sweet and salty combo…I would make these in my dehydrator. They sound amazing! I love how simple and healthy these are! Thanks for the recipe, I need some good healthy noms to snack on! Your Christmas day sounds so relaxing and fun!! I’m not really a big chip snacker either, but I love the sound of homemade apple chips! I love the new banner! It’s (even)more adorable than the last one, and that’s a lot to say ;–) I like these chips too. Healthy snacks are my fav and the salt addition sounds great! I love the idea of home made apple chips! The ones at Whole Foods are ridiculously expensive and I can finish the tiny bag in like 2 minutes 😉 My dad is SO difficult to shop for when it comes to Christmas presents! I’m dedicating this Saturday to hitting the mall and trying to finish up! I love your festive banner! When I was a kid it was torture we had to wait till Christmas afternoon to open our gifts because we had to wait for our Grandparents to come over. These days it tends to be Christmas morning so we can get everything cleared up ready for a day of eating to excess 😀 By the way I love the sound of these apple chips, I love a health alternative for a snacky food. Apple chips are such a wonderful healthy snack. Love the addition of sea salt! I have a few relatives that are soooo hard to shop for – so the last few years I’ve just done homemade treats (which has gone over very well!). And we open presents Christmas morning : ) These apple chips sound like such a great snack – I’m not a big potato chip person either. Homemade treats are such a nice gesture, love that Ashley! These look like the perfect snack! I am going to make them with my kids. Fabulous photos, by the way! I love your salty take on a traditionally sweet snack, Pamela! 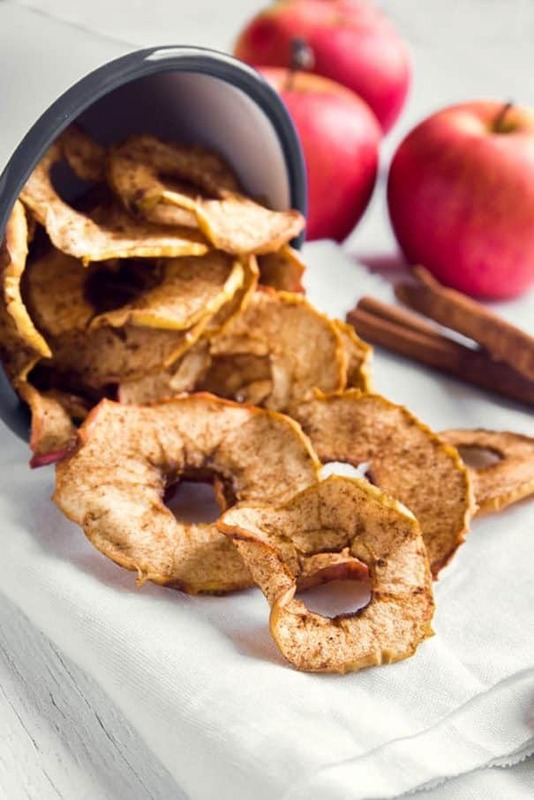 These apple chips look irresistible! I need more healthy recipes like this around the holidays. Thanks for this great recipe. Love the new banner – the lights and Santa cats are sooo cute!! Totally not done shopping. My preteen nephew is tough to shop for! I don’t know what is hip with that age group! It also doesn’t help that my hubby likes to be surprised. AGHHH! So much pressure! I love to shop from a list!! I can’t wait to make these! I have wanted to make apple chips for so long – and these look so good with the sea salt. I actually put salt on a lot of my fruit – it really enhances the flavor!! Love the idea of adding a pinch of salt to fruit, something to balance the sweetness. Good luck with shopping Gretchen! I hear you about the Nets, this season has been brutal so far. PS I’ve just found you through a post on Sashi’s blog, loving what you’re doing here! I always saw apple crisps as a sweet thing, something to snack on, but this idea with sea salt sounds delicious! I LOVE your new banner! It’s awesome! I am all done Christmas shopping. We typically open presents on Christmas morning, but we have done it on Christmas Eve. There’s just something about spending Christmas morning watching a Christmas movie and opening presents without a care in the world. I need to make these apple chips as present opening fuel! I love your banner and the blinking Christmas lights, it’s Christmasy & adorable! I usually open my presents on Xmas morning, sometimes the night before when some family friends had to leave on Xmas day. The sea salt baked apple chips look and sound tasty, I love salty and sweet chips! I love the apple chips I buy at the store. I should make my own! I’m sure they are way better home made. I was just wondering recently how to make my own baked apple chips, and here you are to save the day! I love all your dried fruit and veggie snacks like this, the edamame, and the the corn. Thanks for keeping the hits coming, Pamela. Hope to see you tonight at Saturday Night Fever! These look fantastic! I pinned them and will have to give them a try!! I love apple chips, my great- great grandmother used to make them in bulk. I’m lazy to make them so I buy them from the Amish Farmer’s Market, they have 2 varieties sour and sweet apple. Sour is awesome! Just wanted to confirm that this is 250 F.
I baked this today morning. Most of it came out crispy. Thank you. Thanks for letting me know Chandra! Enjoy! I never would have thought of something like this. This is awesome. So healthy and yummy!!! Apple season is here and this looks like a great recipe to try with all my local orchard apples! Oooh, the kids and I love apple chips! But they can definitely get expensive fast. This looks like a great project to make with them…they always love to use the apple corer/peeler. Thanks so much for sharing at the #happynowlinkup! pinned….I have always wanted to know how to make apple chips. This recipe looks delicious. Thanks for the recipe. Found it through Friday Favorites party. Thank you for sharing this recipe at Create, Bake, Grow & Gather this week. I’m delighted to be featuring this post at tonight’s party and pinning to the party board too! These look delicious looking forward to baking some. Thanks for the recipe. These are indeed a perfect healthy and guilt-free snack. I am sure I would finish a huge serving of these.😁 Thanks for bringing these at Fiesta Friday party! Have a lovely weekend!